Tours operate on Mondays, Wednesdays, and Fridays. Departure time is 9 am. The tour is available all year. Take this tour in the summer for the opportunity to swim in the sea. We are comparing Arrabida and Sesimbra Day Trip with Wine Tasting Prices from leading ticket suppliers and Try to find you Cheap tickets prices on the market. Jump onboard a full day excursion from Central Lisbon and become acquainted with the delicious flavours, rich history, and jaw-dropping natural features that this region has to offer. Meet with your bilingual guide nice and early and leave the Portuguese capital via the impressive Vasco da Gamma bridge. The first stop is in Pamela Village where you can visit Pamela Castle, a unique structure dating back to the days of Moorish occupation. Continue along a beautiful coastal road, gradually journeying deeper into the Arrabida Natural Park taking in the vast diversity of Flora and Fauna that thrive here. To break up the journey to Sesimbra we'll make a stop at one of the regions magical beaches, Portinho Arrabida where you're welcome to dip your toes in the sea and lounge on the sand. In Sesimbra, you'll be free to explore the seaside town at your own pace. The highlight of this trip is a stop at a family-owned winery where you'll be introduced to the local owners, take a tour of the wine cellar and taste a variety of 6 Portuguese wines. The final treat is on the return journey to Lisbon, you will cross back into the city via April 25th Bridge and climb to the iconic Cristo Rei statue for fantastic views over the Targus River. This is a great tour for visitors looking for a relaxing sightseeing day outside of the city centre. 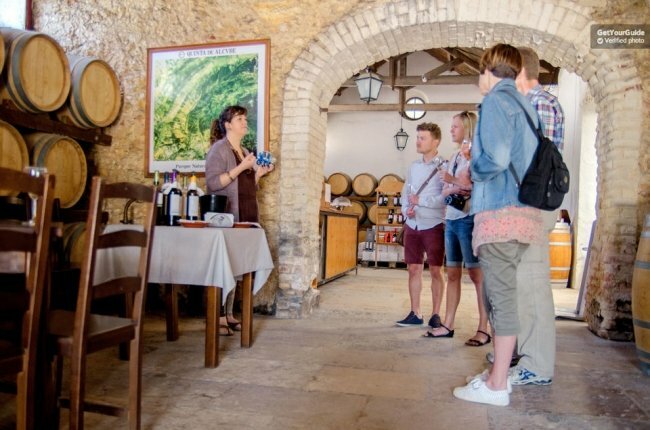 Wine and food lovers, nature enthusiasts, and history buffs can also enjoy this tour as it visits historic sites, a stunning natural park, and allows the opportunity to taste local foods (not included) and wines. Your Experience With Arrabida and Sesimbra Day Trip with Wine Tasting? Discover Portugal's golden coast and stunning natural beauty on a day trip to Sesimbra and Arribida from Lisbon. Relax in a comfortable air-conditioned coach with your local guide. Get a taste for delicious local wines at an authentic family run winery. Traverse the longest bridge in Europe, enjoy panoramic views from the Cristo Rei Monument, and visit a castle dating back to the regions Moorish era. What Arrabida and Sesimbra Day Trip with Wine Tasting Includes? Round trip transport from Central Lisbon by air-conditioned coach. Visit to local vineyard with tour of wine cellar and wine tastings. Central Lisbon – Pamela via Vasco da Gamma Bridge – Family run winery in Azeitao – Arrabida Natural Park (Portinho Arrabida Beach) – Sesimbra – Return to Central Lisbon via the Cristo Rei Monument and April 25th Bridge. If you are travelling in groups and your preferred language is not English you can contact tour suppliers in advance to arrange a private tour in your chosen language. Travelers Reviews about Arrabida and Sesimbra Day Trip with Wine Tasting? This tour has received a total of 80 reviews on TripAdvisor with an overall 5-star rating. Comments agree that this execution is well organised with excellent guides. Participants especially recommend the small group size and stop at the family winery. A minor criticism is that the meeting point is a little confusing, be sure to arrive in advance and check in with the driver when you see the mini-van. Tickets will be received via email and will be accepted by your guide in printed or mobile form. Viator and Get Your Guide have refundable ticket policies. Viator tickets are refundable up to 7 days in advance but cancellation fees will apply for any cancellations made less than 7 days in advance. Get your Guide tickets are refundable up to 24 hours prior to tour date. Lunch is not included in the price of this tour. Please wear comfortable shoes as moderate walking is involved in this tour. All tours will be conducted in English with the possibility of bilingual tours for groups of mixed nationalities. Anyone under the age of 18 will not be permitted to take part in wine tasting. Children are permitted to join the tour, please advise child's age when making the reservation. Meeting Point: Avenida da Liberdade, 2, Central Lisbon (in front of the Hard Rock Café).